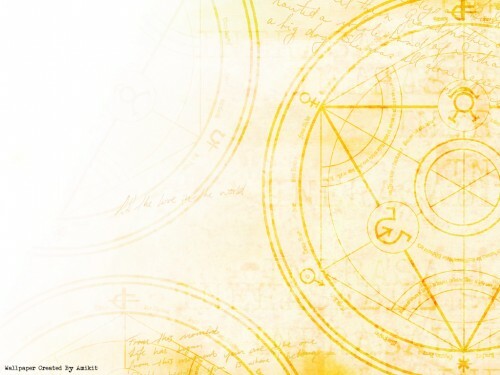 This wallpaper shows the transmutation circle that shows up a lot on the anime/manga series "Fullmetal Alchemist." I draw the image in Illustrator and import it into photoshop. Then I used the same filters and photoshop brushes from my other FMA wallpaper "Broken Automail." This is part of the "FMA Symbols" wallpaper series. I love it, i have been looking for the circles for a desktoop for a while its great thanks! I like the color of it. Its a nice bright gold color. You did a really great job on it! Definatly a good wallpaper. Awesome!!! that would be a great background for anyones desktop! great job with the blending! I wonder how such a great wallpaper would look in other colors? gorugues wallpaper please make more! i love it! nice series of wallpapers! i love them lots! excelente logo de full metal gracias!